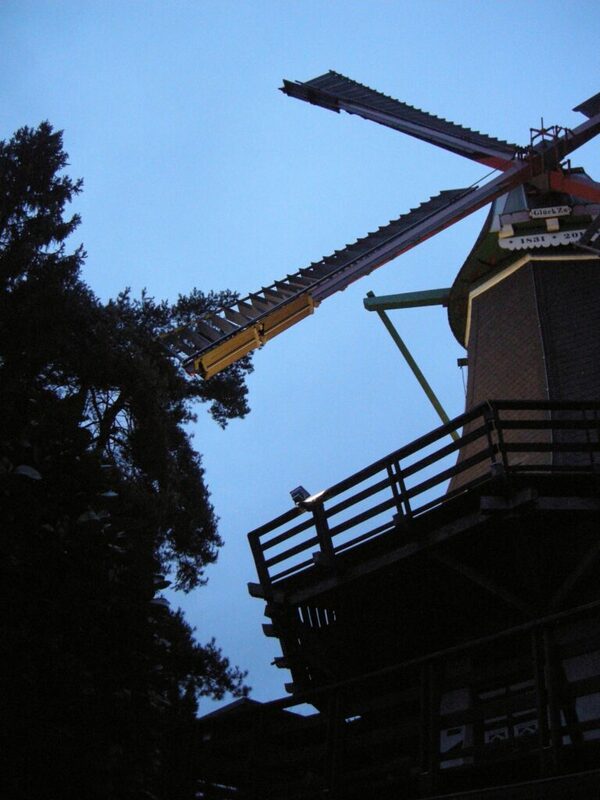 Karin is delighted to exhibit in a solo show selected works from her Mill Cycle in the gallery space of the Bergedorfer Windmühle, a museum in her home town Hamburg. She created this body of work over several years and has shown it in solo exhibitions both in London (Tom Blau Gallery) and Bristol (Watershed). 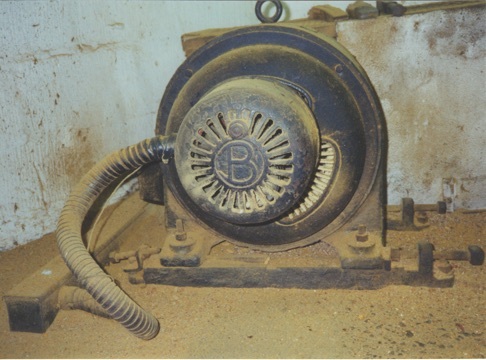 The P&O Mill, Butlers Wharf, London, famous for its grinding expertise, was facing closure when Karin obtained permission to photograph its interior. 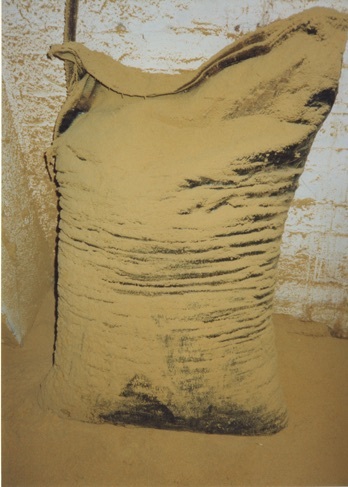 She used a simple analogue camera to take pictures of spices spilling over machines and to the ground from sacks and bales in a first process of transformation. Today the defunct Mill situated near Tower Bridge is a complex of luxury apartments. 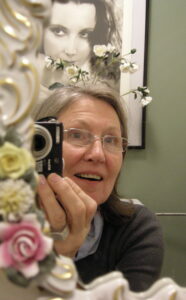 Karin works with the single unedited photograph as her medium. 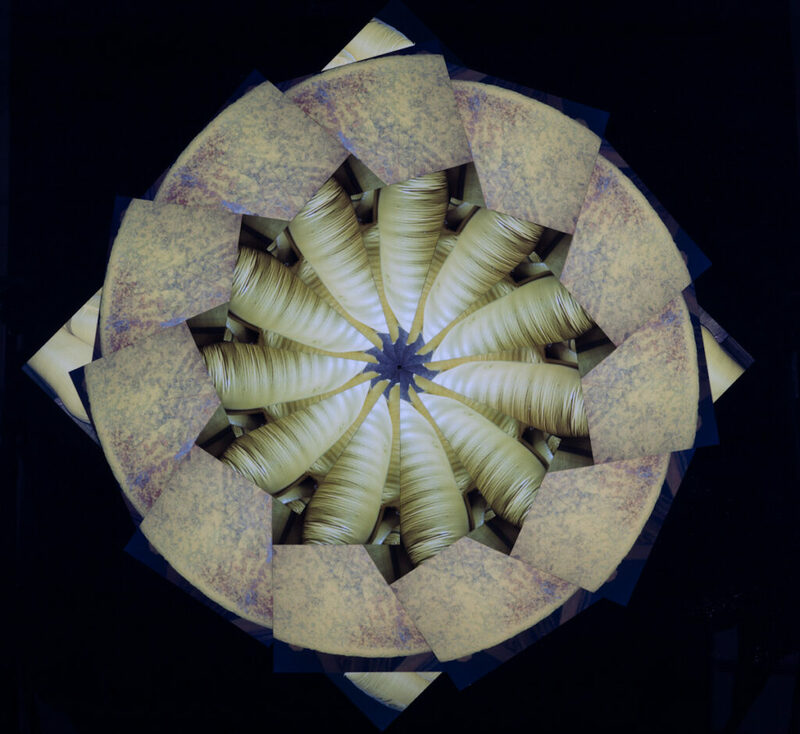 From the multiples of one, rarely two photos she creates an abstract image. 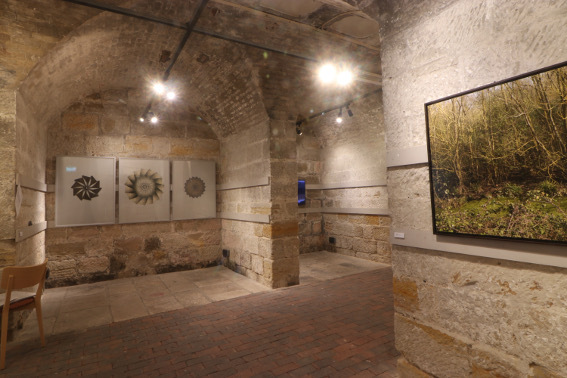 These constructed images, mounted on board and framed under glass, explore through their formal layout and content the complexity of the industrial processes and the transformation of a working Mill into an enchanting Aladin’s cave. Plant/machinery/cogwheel and plant/spice/flower merge into one organic whole. Karin’s work invites the viewer to consider that something is irretrievably being lost. 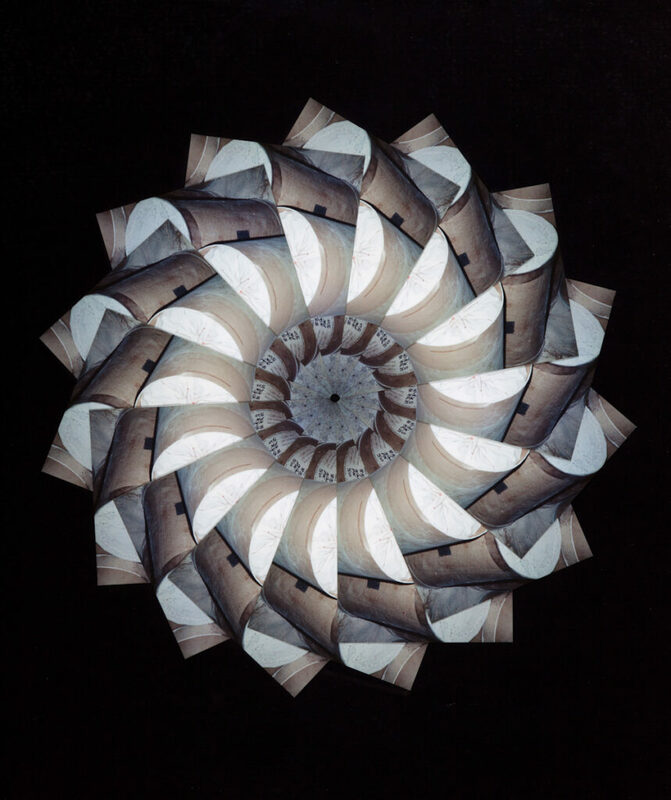 Geraldine Norman wrote in The Independent: ‘An exhibition of dazzling photomontages at the Tom Blau Gallery is this week’s most exciting (London) show’. 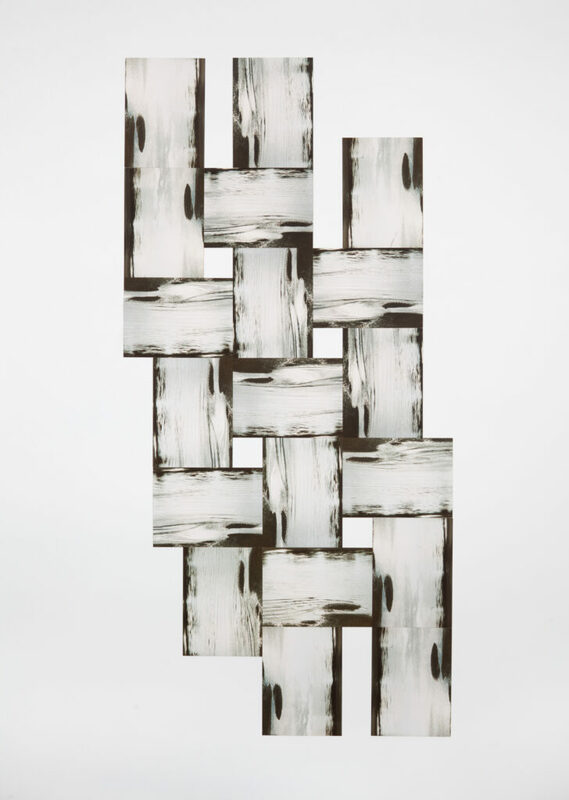 Professor Dawn Ades considers that the way Karin uses her medium goes ‘way beyond photomontage’. 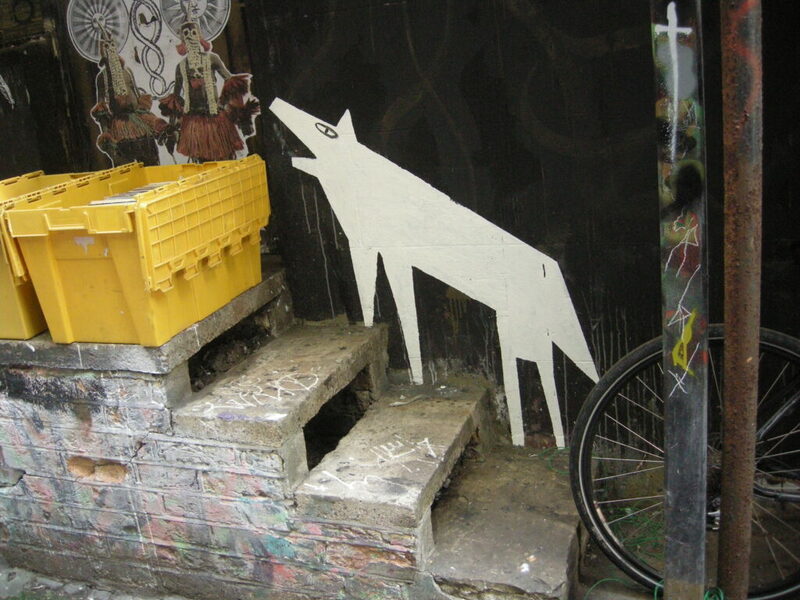 Ich zeige ausgewählte Werke aus meinem über mehrere Jahre entstandenen Mühlenzyklus, den ich in Einzelausstellungen in London (Tom Blau Gallery) und Bristol (Watershed) vorgestellt habe. Meine Arbeiten zeigen die letzten Tage der berühmten P&O Gewürzmühle in Butlers Wharf, London, heutzutage Luxuswohnungen. Ich habe den Speicher mit einer einfachen analogen Kamera fotografiert: Gewürze sickerten aus Säcken und Bällen über Boden und Maschinen und verwandelten den viktorianischen Speicher unweit von Tower Bridge in einen Ort von außergewöhnlicher Schönheit. Ich arbeite mit der einzelnen Fotografie als mein Medium. Über meine Imagination wird diese Fotografie durch Wiederholung zu einem neuen formgewordenen Ganzen zusammengefügt. Der Zyklus ist sowohl Hinweis als auch Fragestellung an den Betrachter: geht hier etwas Wichtiges verloren? Geraldine Norman schrieb in The Independent, die Ausstellung ‘of dazzling photomontages’ sei ‘the most exciting (London) show’. 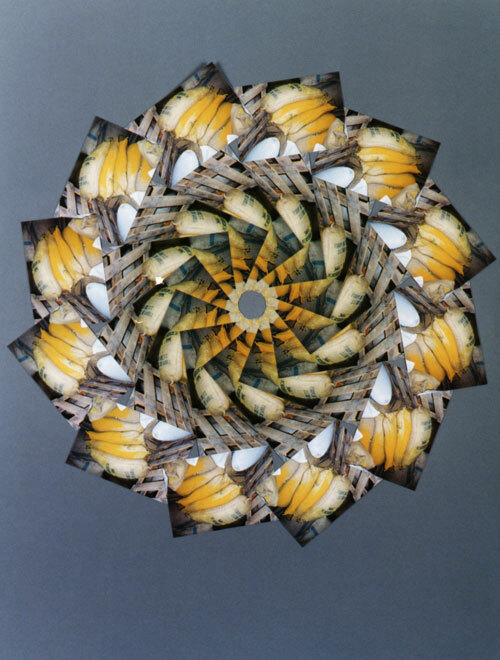 Laut Professor Dawn Ades geht meine Art zu arbeiten weit über Photomontage hinaus. 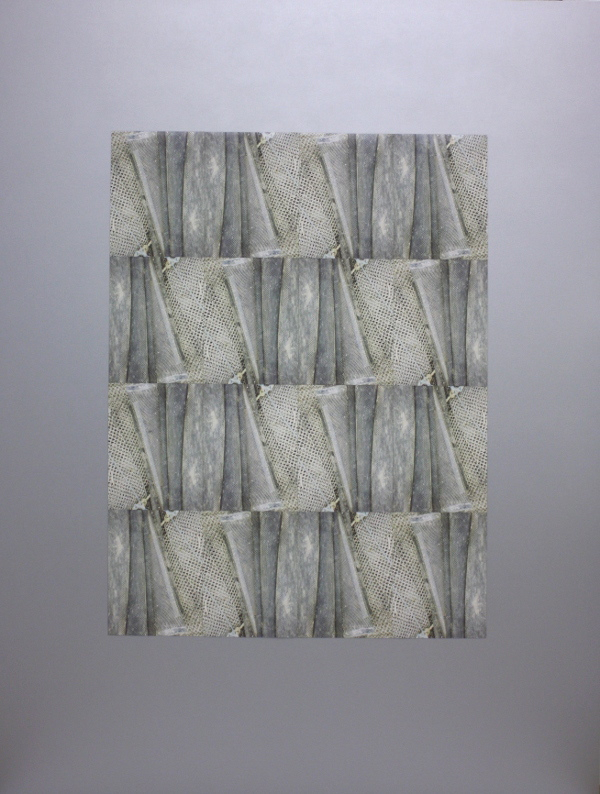 Karin showed a key work from her Bankside Power Station Cycle in this group exhibition. 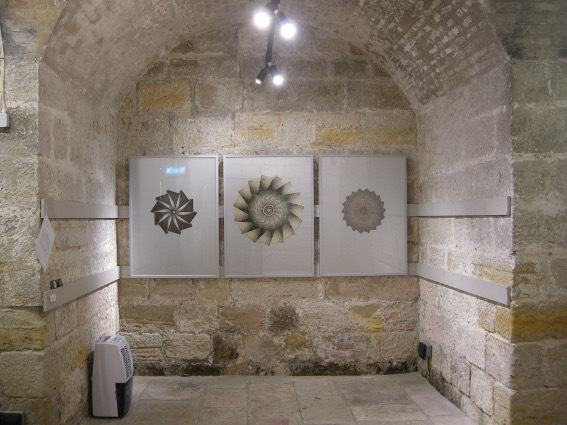 The work, Turbine Triptych, was first shown in a 2011 solo exhibition The Power and the Glory at Candid Arts, London. The Bankside Power Station, darkly lit and immense, seemed like an industrial cathedral. Karin decided on the formal element of the triptych to convey this quality and that the triptych would have to have as the central image the ‘turbine’. There was no one to ask and she had no idea where to find the turbine or indeed what it looked like. 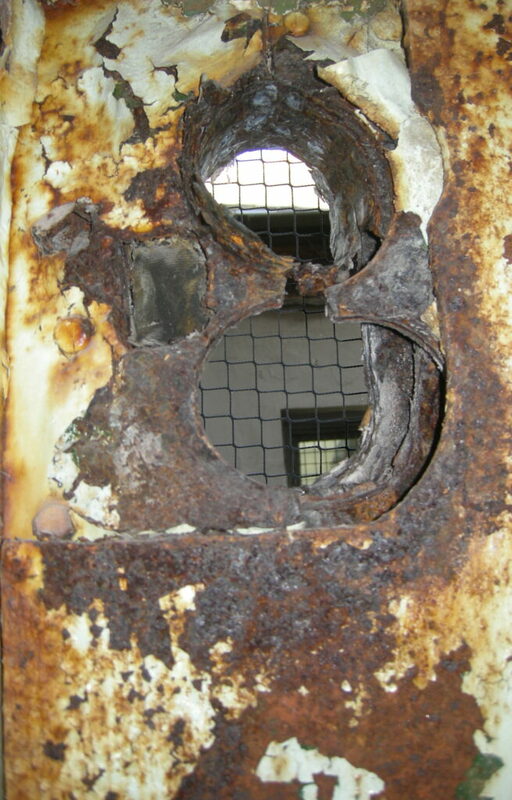 Then, deep in the bowel of the building, asbestos contaminated and closed to the uninvited, Karin stumbled on what she was then told were the turbine blades. She photographed a small section. From this shot and its multiples she created an imagined machine that in its detail is of the turbine. She placed it in the centre of this industrial altar. It is sufficiently not the turbine so that the viewer can have his own response. The completed abstract image has a beauty of its own. 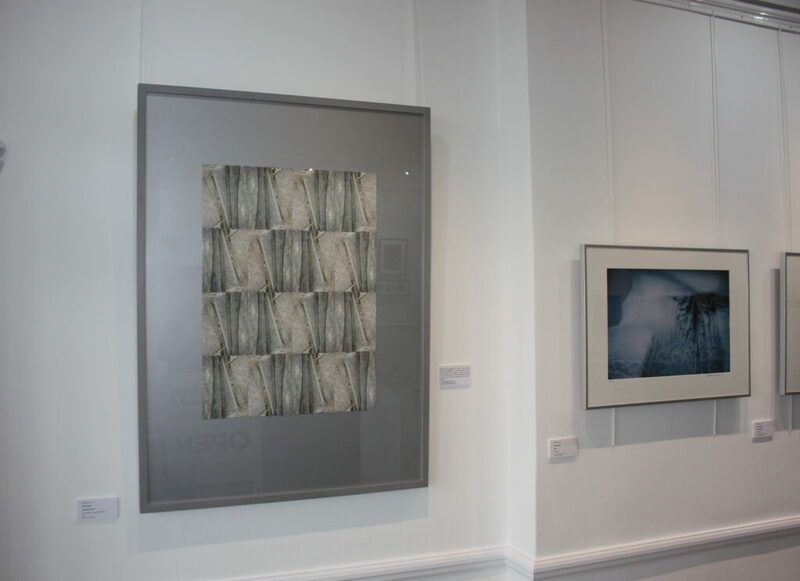 Three panels, two are multiples of one photograph and the centre panel multiples of two photographs all mounted on board under glass. 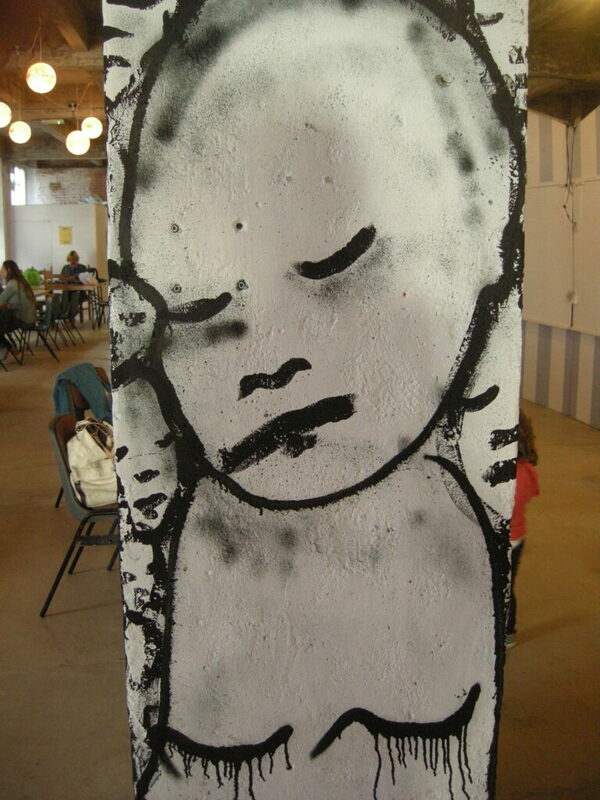 Karin is showing her work Fusion in the Bermondsey Artists’ Group Outpost exhibition at the Shortwave Cafe. 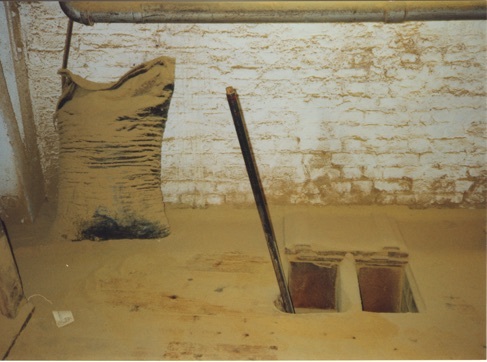 The work is part of the Mill Cycle which celebrates the magic interior of the now defunct spice mill at Butler’s Wharf in the London Docklands. The created image references Plant (cogwheel/machinery) and Plant (spice). 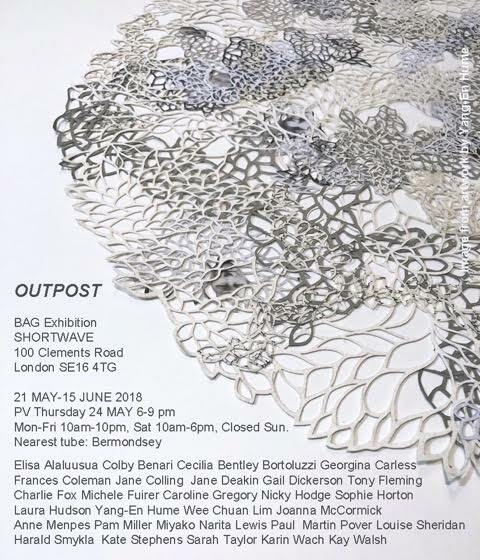 Established in 1983 Bermondsey Artists’ Group BAG is an artist-led initiative that supports Cafe Gallery Projects London and creates opportunities for artists who live, work or study in Southwark. This peer-led network is a rare longstanding grassroots collective, maintaining a democratic framework and consistent core values; to support local artists to show their work and develop their practice. 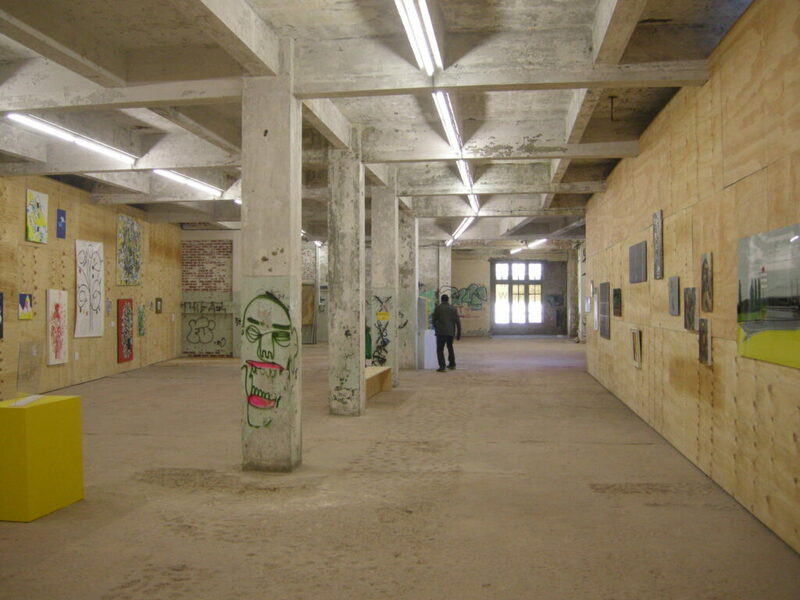 The Shortwave Cafe is a large exhibition space at the former Peek Freans Factory. This factory is well-known for Damien Hirst’s early exhibitions (also the fantastic BAG exhibition Meme 2007) and will sadly in part be demolished by the end of the year. The exhibition is open from 21 May to 15 June. 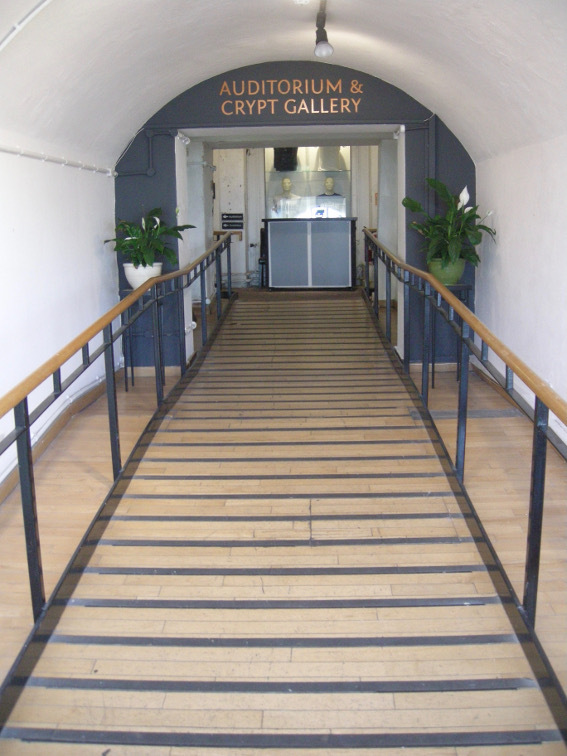 Opening hours are 10.00 – 20.00 Mondays to Fridays and 10.00 to 18.00 Saturdays. The exhibition is closed on Sundays. 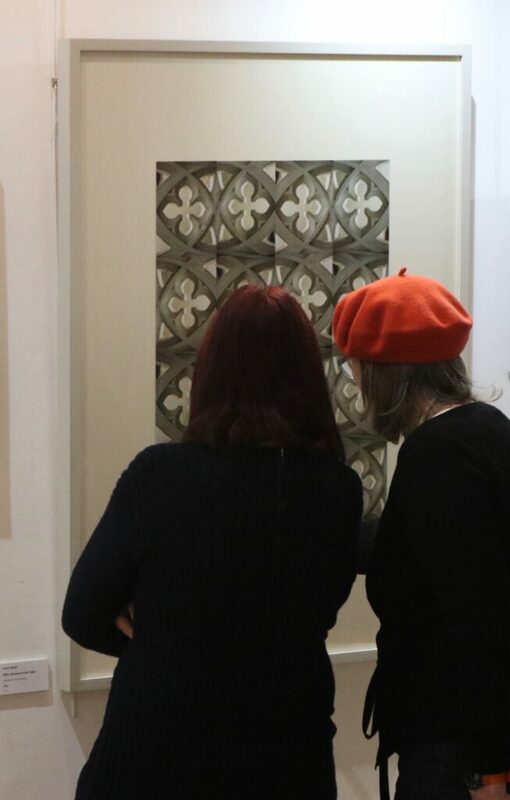 Karin has exhibited her work With Reference to the Tower (Gothic Affinities) at the Hastings Arts Forum Members’ exhibition (Hastings Arts Forum, 36 Marina, St Leonards on Sea, TN38 0BU) from 20 March to 1 April 2018. Karin sees Tower Bridge as the architectural and benign off-spring of the notorious Tower. 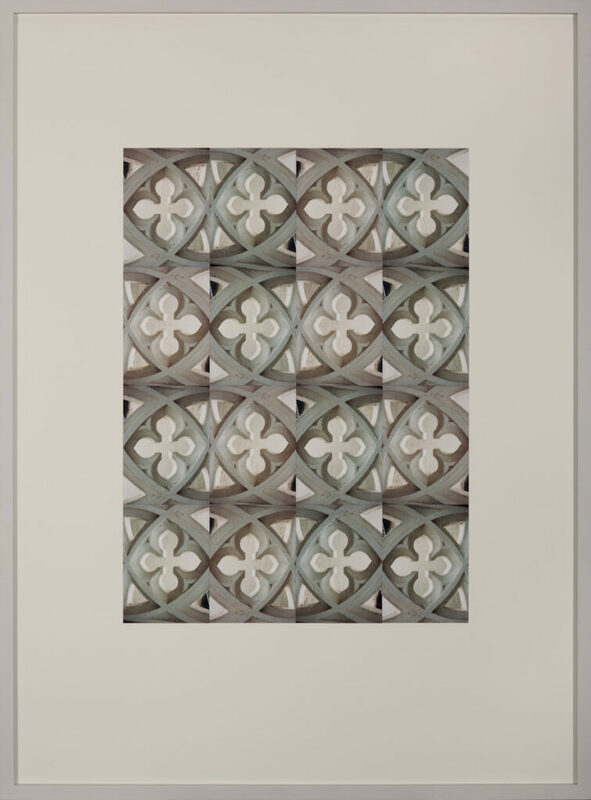 From the multiples of a single photograph of one element of the Bridge balustrade through which the Thames is seen (the documentary element) she created an image of a ‘window’ (the imagined) that is – and is not – of Tower Bridge or the Tower, (n)or of ancient Gothic Churches. 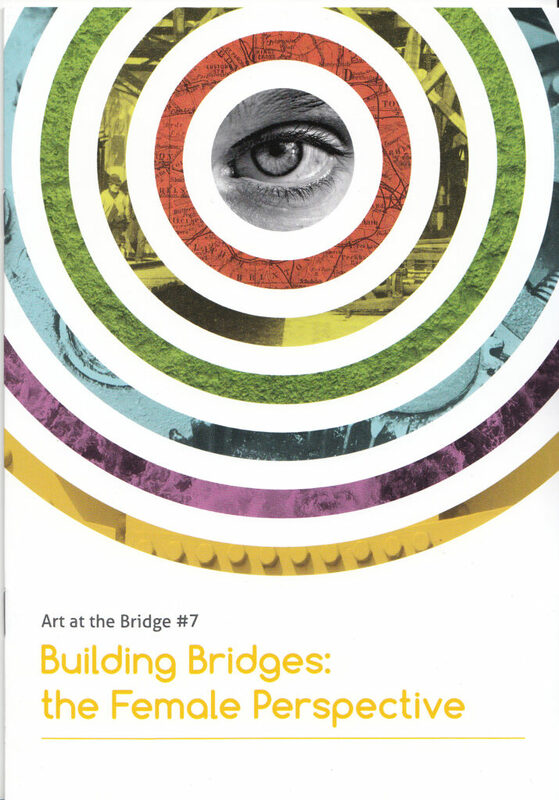 Bringing together what seems separate or fragmented and yet related is, for her, a bridge to a deeper understanding, and using as her medium a photograph of no great merit is a way of challenging what has and has not merit. 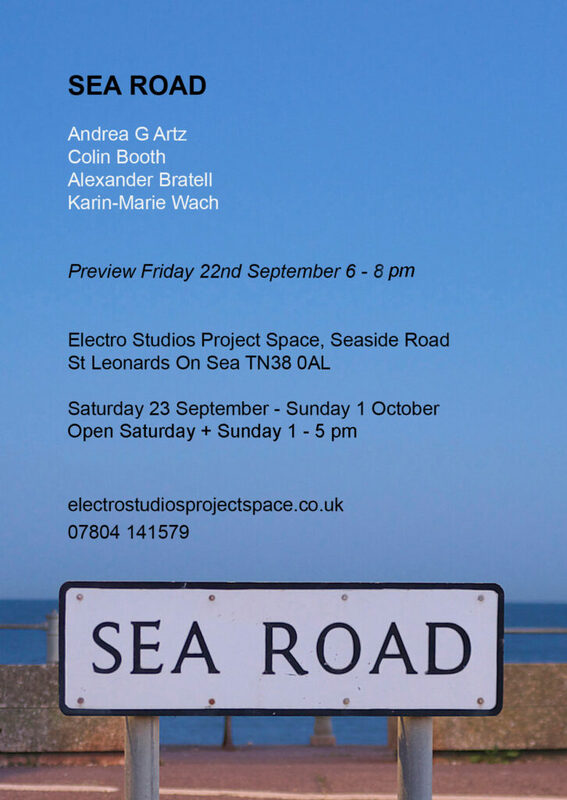 As part of Coastal Currents and PhotoHastings, Andrea Artz, Alexander Brattell, Colin Booth and Karin took SEA ROAD, the title of their exhibition, as a metaphor for the work that was on show. PS No, I didn’t include it; “the gallery space didn’t like it”. 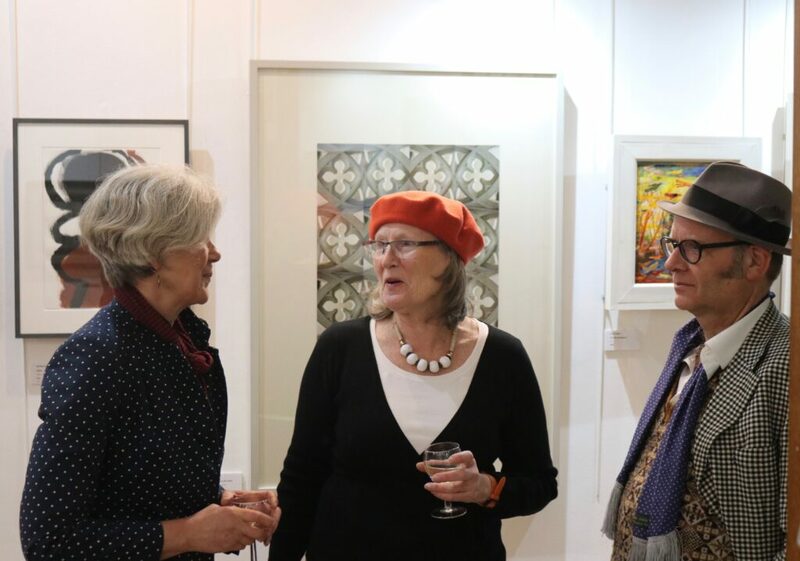 Karin was pleased to have been invited by Stephanie Goj to show a selection of her work at Graze on Grand, St Leonards-on-Sea from 18 October to 27 November 2016. 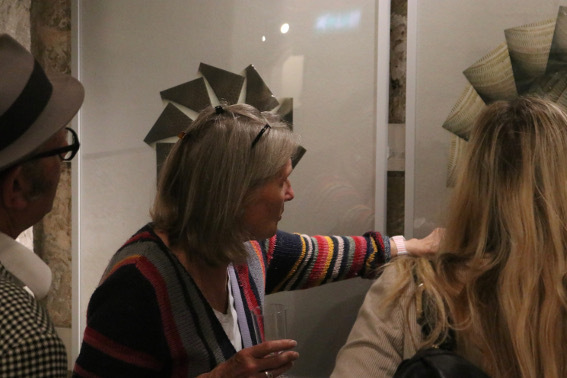 Karin’s work Reinvented was selected by Tower Bridge in partnership with Southwark Arts Forum for this exhibition which took place at Tower Bridge in London for seven months in the spring and summer starting on 8th March 2016. Karin exhibited this work for the first time. 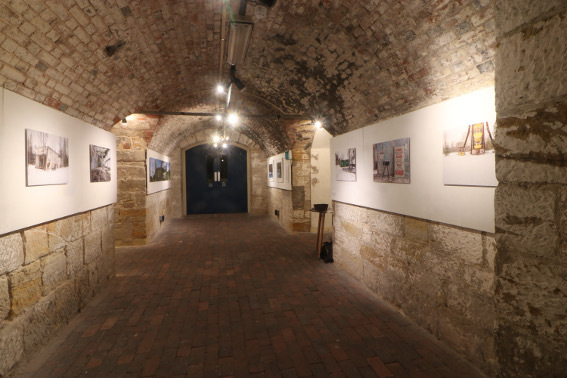 This work brings together, in one created image, the history of the locality on the south-east side of Tower Bridge: The formal arrangements of the photographs reference the squares of Butlers Wharf, the bridge road and the structure of cranes that once lined the wharves. The travelling crane rails live on in the photograph of the cladding of a contemporary building in Shad Thames; the inserted photograph of a bollard, removed from the Thames wall as the locality reinvented itself, witnesses the maritime history of the area. Bringing together what seems separate or fragmented is, for me, a bridge to a deeper understanding, and using as my medium an ordinary photograph challenges what has merit. For information on the exhibition click here. Karin exhibited at the Hastings Arts Forum Members’ Exhibition from 26th January to 7th February. 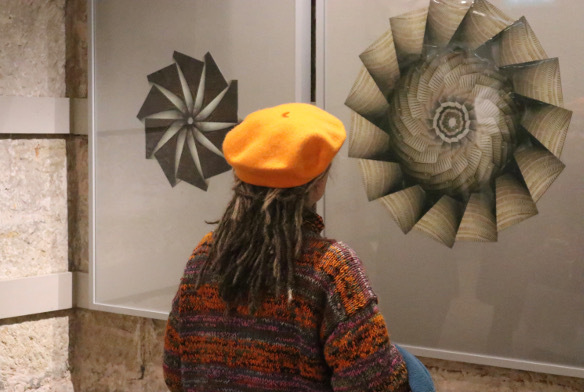 She showed one work that belongs to the Mill Cycle exhibited in solo exhibitions in London and the Bristol Watershed. 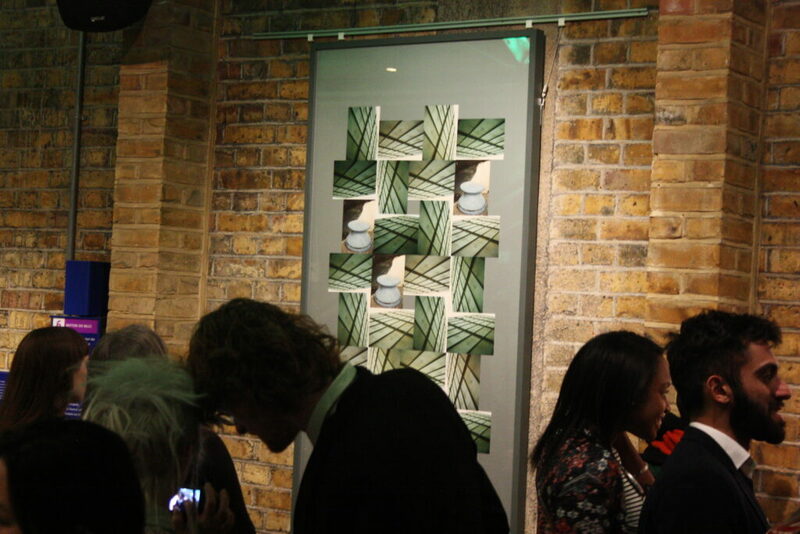 The work was created from multiples of one photo taken in the P & O Spice Mill, Butlers Wharf, London, at that point threatened with closure and now defunct and luxury homes. 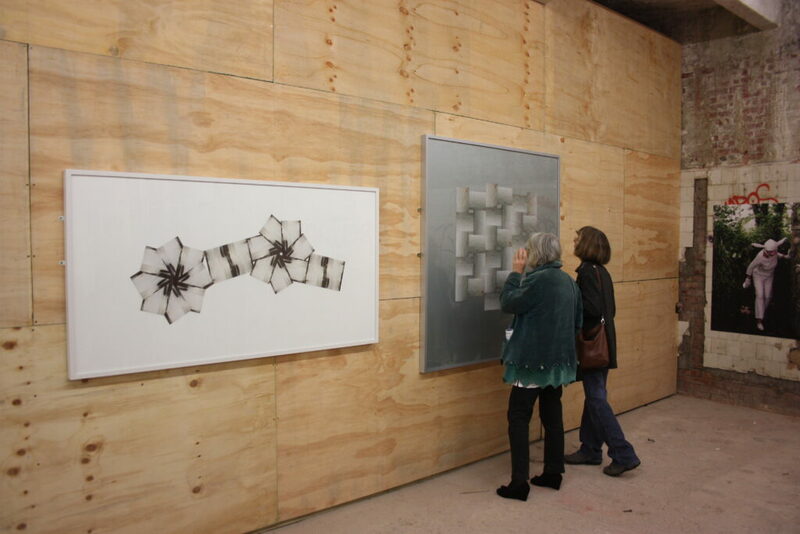 Here are two pictures showing the work at the exhibition. 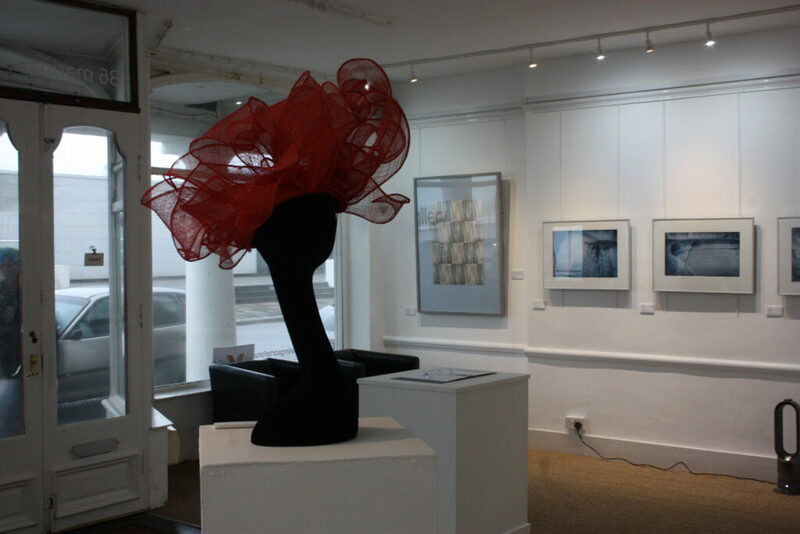 The amazing hat in the foreground is by Caroline Morris, another HAF member. 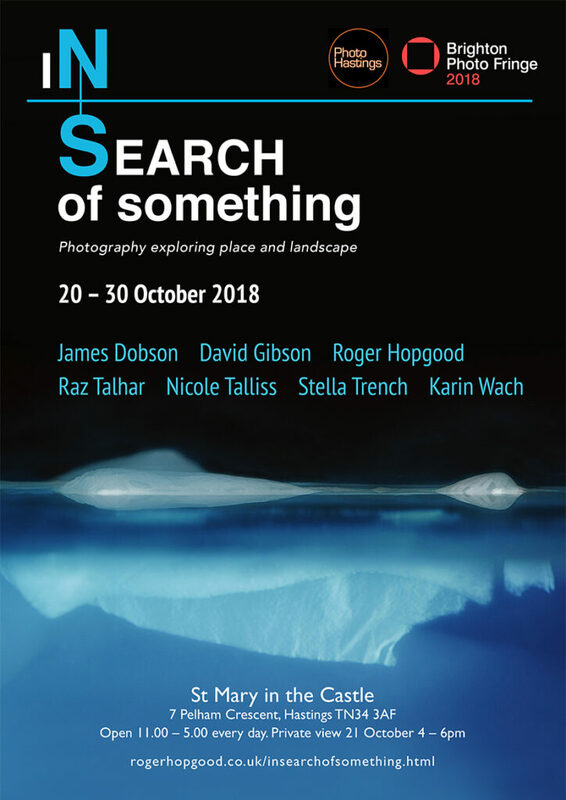 A spontaneous exhibition for PhotoHastings 2015 in response to an unexpected gap in the Observer Building’s gallery schedule following A Sense of Place curated by Grace Lau and Andrew Moran. 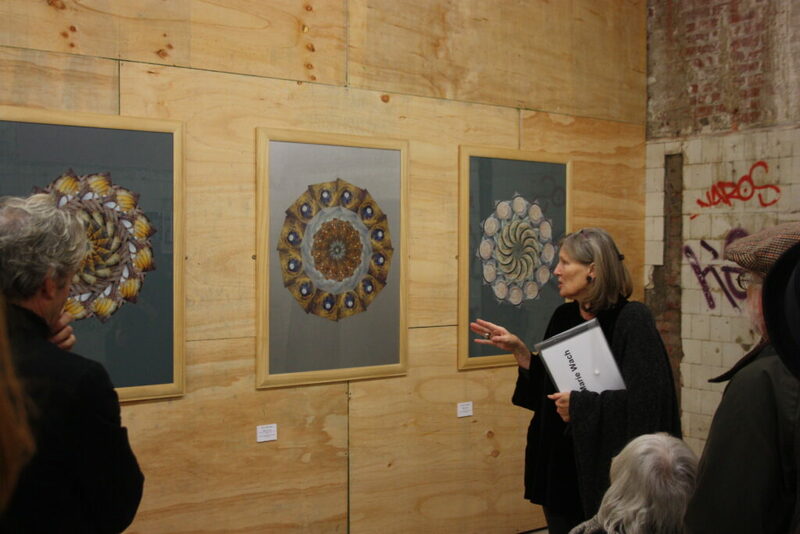 Karin showed three works from her Mill Cycle last exhibited at the Watershed Gallery, Bristol. 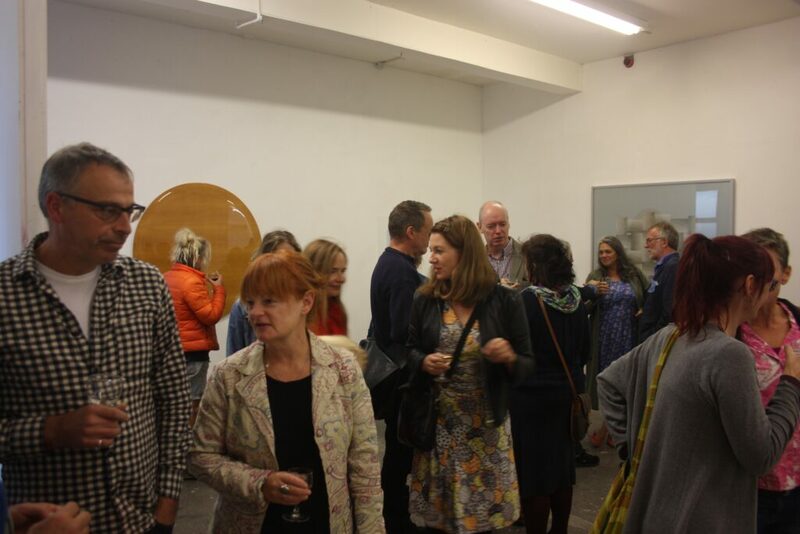 On Saturday 28 November at 6pm there were artists’ talks followed by a drinks reception and a live DJ. 14 November 2015. She is pleased to have been selected for this show. 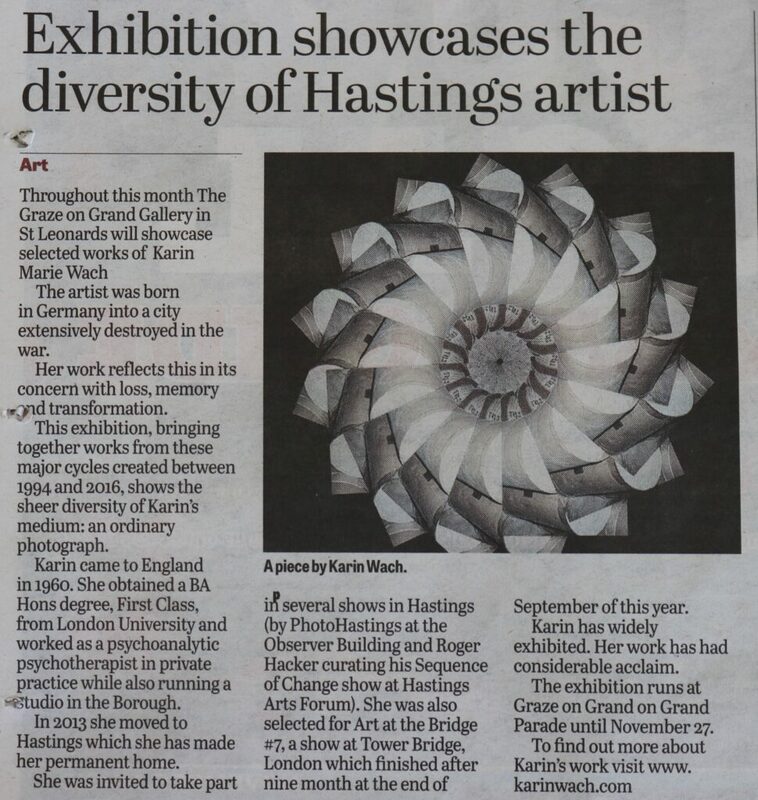 The exhibition has been reviewed by the Hastings Online Times. Karin’s works explore that which is in the photo and that which is not e.g. small islands in the river at low tide are re-created through the shape of the image but so is the flow of the river from where it is rural, gentle and beautiful to where, in Urban River II, the Thames becomes angular, is dissected by bridges and hemmed in by walls and wharves while litter bobs around. In this work a red canister moves through the image on its way to the sea. 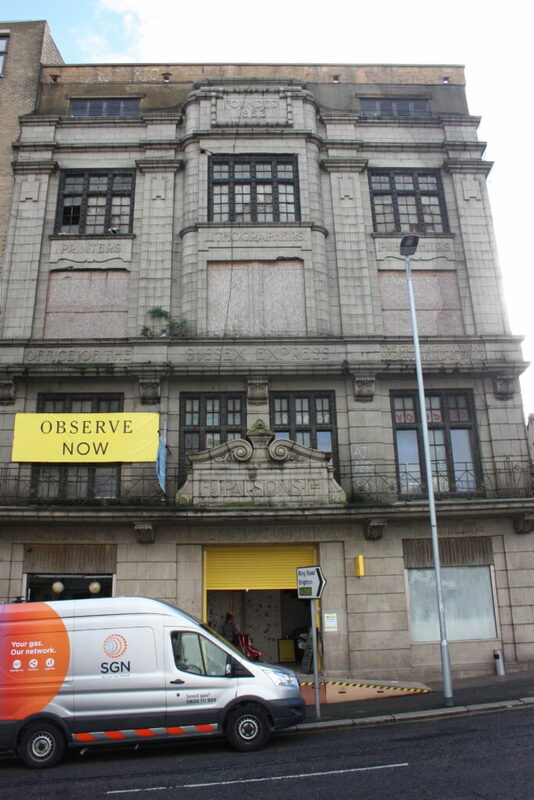 The Observer Building is a temporary art space and the gallery part of it is vast. Inside and outside the building, graffiti artists have left their mark and it will be interesting to see how well the curated exhibition will sit with random and spontaneous mark-making. For Karin this is a new experience and she is curious as to how it will work out. Karin has taken some snapshots of the site and building.